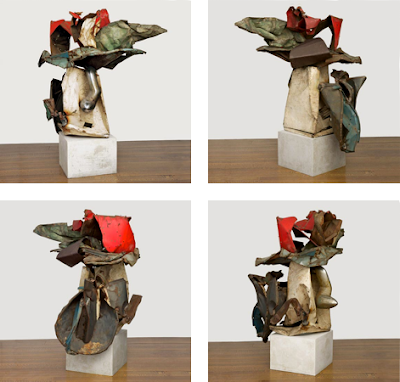 Hatband, 1960; painted steel, 58 1/2 x 53 x 38 in. One day something––some one thing–– pops out at you and you pick it up, and you take it over, and you put it somewhere else, and it fits, it's just the right thing at the right moment. completely new ideas came into view as changed shapes and colors took precedence. It made for the most marvelous viewing experience, as though the sculpture was nudging me "look at this! look at this! the world is ever new." I wish I could have taken photos at the show because there were so many great moments in these pieces: the way one color sat next to another, the twist of a form and the relationship of one to another, the wearing off of color where it was stressed by folding or age. No photographing allowed, so these images come from the museum's website for the show, link here; there is also a good amount of information on the artist and the work on the site. For instance, Chamberlain's titles are often very odd and witty, so we are given a lexicon with possible explanations. While I thought that Hatband referred to a hat, I am informed that it's a poker game in which each player has a card in his hatband visible to only the other players. Who knew? Fantail, 1961; painted and chromium plated steel, 70 x 75 x 60 in. To continue with the lexicon, a Fantail is the overhang at the stern of a ship which is often shaped like a duck's bill, and there is a shape just like that in the 3rd view below and soaring outward above. But that's not what struck me about this piece; what I kept thinking of its columnar form topped by a wildly spreading group of shapes, seeming ready to take flight, was that it reminded me of the Winged Victory of Samothrace. Each angle of this piece was a new revelation, and what I especially loved was the surprising appearance of a cone shaped fender emerging from its innards. 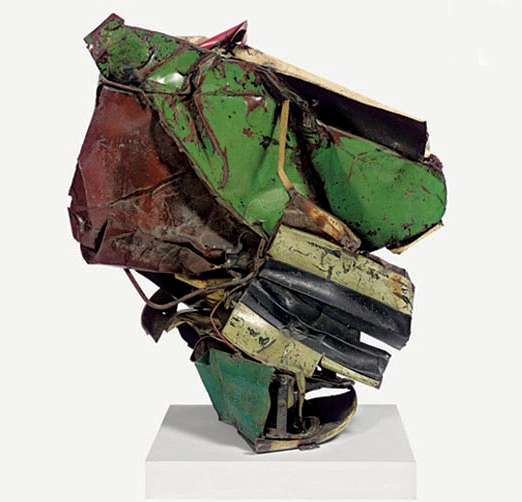 Chamberlain's preferred material of salvaged painted automobile metal allowed him to work with vivid color and then throw in, from time to time, a bit of chrome to juice up the conversation. Untitled, 1961; painted tin-plated steel, 5 x 4 x 3.5 in. One of the great delights of the show were some miniature works, fluid in form and perky in color. 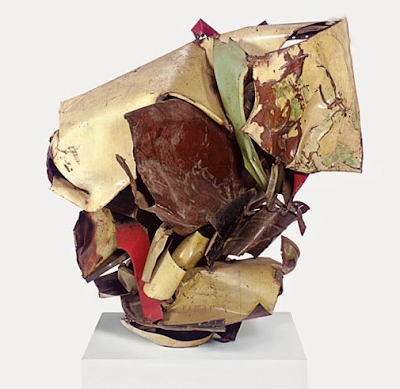 Untitled, 1961; painted and printed tin-plated steel, 7 1/2 x 7 1/2 x 6 in. 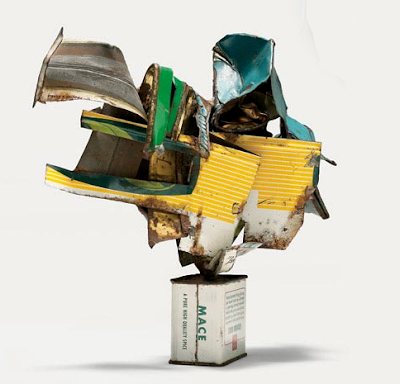 I just love this piece, with it's bursting shapes sitting atop a spice can. In all of his work, Chamberlain transforms the ordinary stuff of life into sculpture; using a spice container that we all have on our kitchen shelves makes the point of the transformative power of art in a particularly fun and witty way. 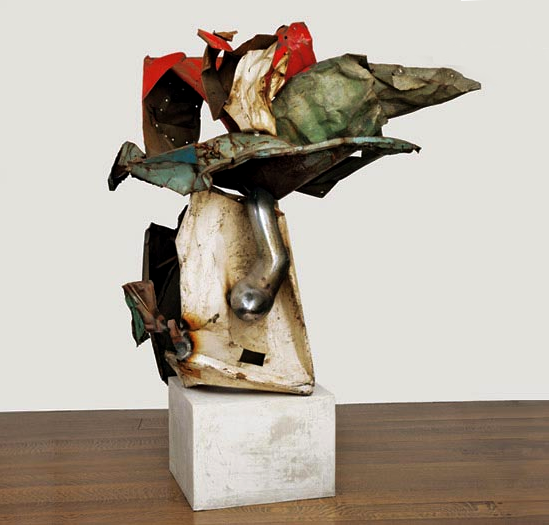 The Hot Lady from Bristol, 1979; painted and chromium plated steel, 83 x 51 x 50 in. The "hot lady" is a naughty limerick, and there is something exuberantly flighty about this piece. 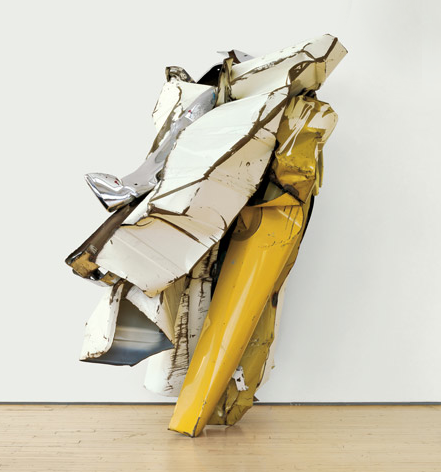 The yellow form is almost figural and the folded white metal, with its dark lines, flows like a robe. 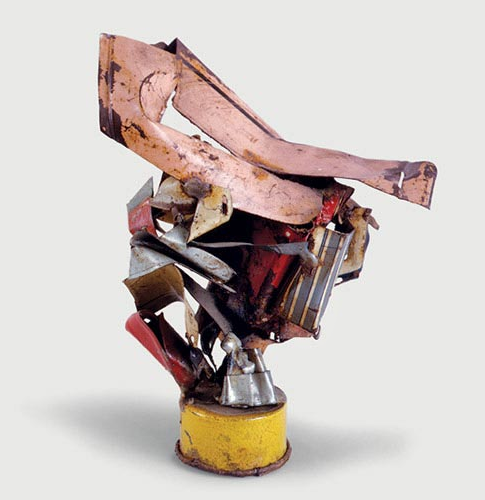 Kiss #12, 1979; painted steel, 30 x 31 x 27 in. 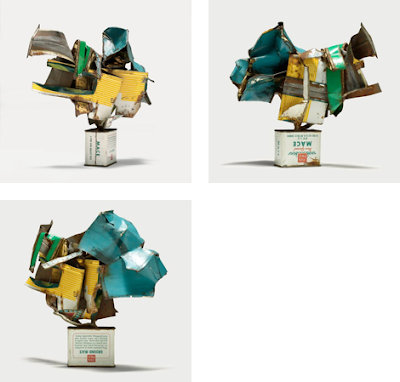 Yes, these works are abstract; they've often been said to be the equivalent in sculpture of Abstract Expressionist painting. 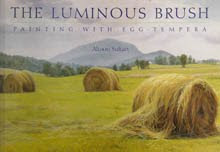 But Chamberlain's sense of fun allows for figural interpretation; he encourages it with his choice of titles. 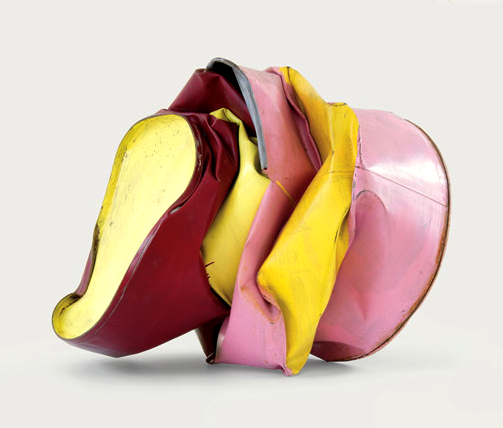 In this version of Kiss, the pink, red, and yellow are as gorgeous as a blowsy dame; the crushed metal drum(s) like bodies crushed together. 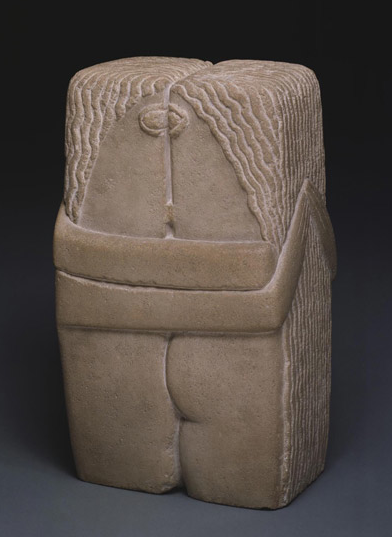 It is an inventive update on Brancusi's sculpture, and like all his work, an utter transformation of forgotten materials into a vibrant presence. Constantin Brancusi, The Kiss, 1916; limestone, 23 x 13 1/4 s 10 in. From the Philadelphia Museum of Art website. rappel, you're right about the energetic brush strokes made physical. There are so many interesting layers to this work. I like untitled 1961...another fabulous post. Thank You. You're very welcome, Jan; I enjoy sharing my enthusiasms. wonderful post, thanks Altoon. Did you get to the Biennial? it occurs to me, looking at the photos you've posted here, that these pedestal pieces would be interesting to compare with Vince Fecteau's sculptures. I haven't seen Vince's new work at the Biennial yet, but looking forward to taking it in, and this show too, hopefully on the same day! thanks, Ravenna. Yes, I went to the Biennial and liked the Fecteau work a lot. His stuff is quite demure and well mannered compared to Chamberlain. I like the 2nd "Untitled" 1961. It gives the impression of smallness, delicateness and lightness while many of the materials are rough and tough and monumental in a way. Elaine, you've put your finger on a wonderful aspect of those very small pieces which use such unartful materials. Another wonderful hour spent on an Altoon post and links. Thanks! I went to the show and it was surprisingly fun and I love the miniature ones and his collages with staples. Thanks for your wonderful photos and comments above to remind me of the pieces. I enjoyed seeing the welding of the pieces and obvious selection of color. And he didnt use many details on cars except for a handle occasionally which added to their magic. I'm so glad you liked the show, alicia. 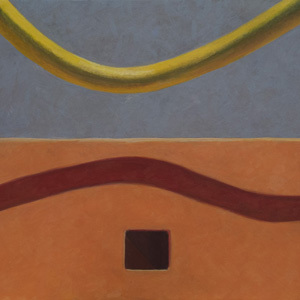 A New Textile: "Arch and Point"
A New Painting: "Right Angle"